Hillary Clinton's problem: Will the economic recovery die before the election? 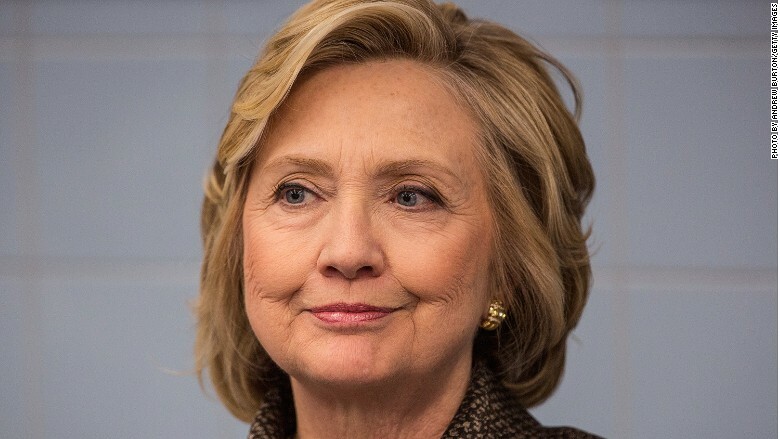 Hillary's problem: Will the economic recovery die before the election? The Hillary Clinton campaign is doing a lot of math on voters and fundraising. But here's another metric they are likely looking at: economic growth. The U.S. economy is finally rolling again. Clinton needs those good economic feelings to last through Election Day if she wins the Democratic primary. The U.S. economy has been growing for 71 months now, according to the National Bureau of Economic Research, the official arbiter of recessions. To put it another way, the Great Recession officially ended in June 2009. Back then, General Motors (GM) had just filed for bankruptcy and Osama bin Laden was still alive. The average length of an economic expansion since World War II is only 58.4 months. 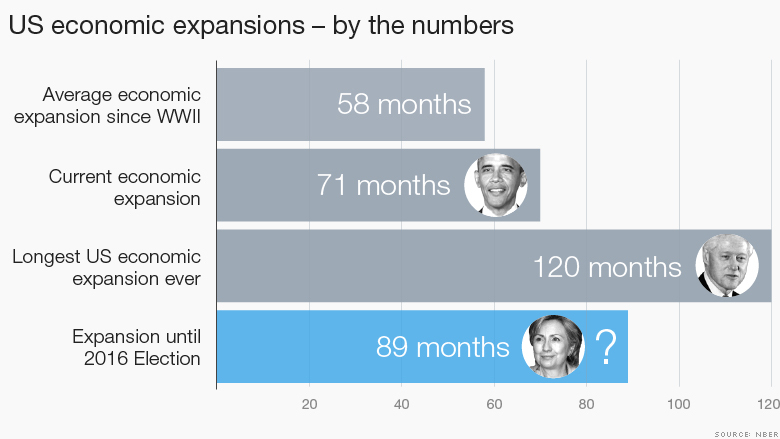 The Clinton campaign likely needs the economy to keep chugging for a total of 89 months to get to the big day. The historical precedent: It's not unprecedented for a growth cycle to last that long. Former President Bill Clinton enjoyed the longest post-war expansion in American history, lasting a whopping 120 months until just after the 9/11 terrorist attacks. Similarly, the "Morning in America" economic expansion during the Reagan White House lasted 92 months, or about 7-1/2 years. How long will the good times last? Things look relatively good for the U.S. economy right now. Gross domestic product, the broadest measure of growth, averaged a brisk 4% during the final nine months of 2014. People are feeling the upswing too. According to a recent CNN/ORC poll, over half of Americans now describe the economy as "very" or "somewhat" good. That's the highest since President Obama took office. It's been a slower start to 2015, but most of that can be explained away by bad weather. Economists say GDP growth will ramp up during the second half of this year, much as it did last year after the Polar Vortex. But Clinton would also be hurt if the economy slows down significantly but doesn't necessarily shrink. Some argue President George H.W. Bush's 1992 election loss was due to economic hiccups and the Federal Reserve, for example. It was a mild slowdown in hindsight, but it doesn't feel that way when you're in the midst of it. No recession until 2020? The good news for Hillary Clinton is at least some smart people on Wall Street believe the current recovery could end up being the longest economic expansion -- ever. Morgan Stanley recently reiterated its thesis that the U.S. is in the middle of a long expansion that may last until 2020. If it stayed alive until January 2020, the expansion would be 127 months old, surpassing the record achieved under Bill Clinton. To make its point, Morgan Stanley points to improving economic factors like consumer confidence, debt levels and delinquencies. The firm also notes that tell-tale signs of a peak in the economic cycle -- like excessive hiring, capital spending and inventory -- are all absent. "Business cycles don't die of old age," Morgan Stanley strategists wrote. "Business cycles tend to die of overheating (excessive hubris and debt)." CNNMoney senior writer Chris Isidore contributed to this report.